That out of the way I can get on with my initial ride impressions. I posed a few questions in my initial article and one was ‘is the rear end stiffer’? I think I can say without any question in my mind that it is. Not that the Spearfish that I usually ride is flexy (and I am talking about the QR version that I have not the 142x12mm version that is also available), but run it down a rocky descent and I can feel the rear end flexing about. The Horsethief is much stiffer in comparison. This translates to a less deflected run on rougher ground, especially noticable where you have a fairly straight run from start to finish. One issue that I am having is with the front end grip, which could easily be influenced by the many variables that are different to my usual bikes. One – probably the most likely – is the basic tyres, which I think give Continental quite a bad name given how good the Black Chilli versions can be. The rear Mountain King is fine however and I weighed one at about 800g which isn’t too bad for a 29er tyre, although it does leave some room for a weight saving and a performance improvement at relatively low cost. Another could be the Sektor fork, or rather the way I have it set up, as adjusting the rebound does seem to have made some difference. I’ll probably change the tyre or wheel for the rest of the review to see if that deals with the problem entirely. It could also be that the slacker head angle and longer seat stays has subtly change the weight distribution compared to the Spearfish. Regardless of what it is I’m sure that with set up adjustments and a fairly small cost for a new front tyre this can be solved. While on the subject of longer seatstays, I’d say that the increase probably doesn’t affect the handling too much on it’s own, but with the slacker head angle the overall wheelbase is 60mm longer than the Spearfish (for the medium frame). I think that is noticeable round the singletrack of the Surrey Hills but is it a show stopper? No. Could I get used to it and adjust my riding style to accommodate? Yes, most definitely, although again I think the 80mm stem gives a fairly XC feel and 10 or 20mm off that might make it a bit more “All Mountain”. Overall the Horsethief has shown itself to be an easy bike to ride with no major bad habits. Hauling 31 lbs up a long climb isn’t much fun, and if you have a lot of tarmac or fireroad climbs to deal with then a shock upgrade to add a platform would be a step forward as the back can get rather active. Under normal circumstances though I don’t think a seated, smooth-cadence rider will have much to worry about. Get up and pedal, and the single pivot design with the basic shock does move about, but I think that is covered in the philosophy of the bike though. Essentially it’s a bike for hammering along the flat and speeding down hill. When you get to the bottom it’ll pedal back up again, but it’s not the strong point of the bike. The grins are had on the downs. I am hindered with my riding at the moment as I seem to be suffering from a “just won’t go away” virus so for more thoughts on the Horsethief I’m going to hand the bike over to Matt. While I remember, it may be worth checking out the blog post on the Salsa website that covers the Horsethief design philosophy. The Salsa Horsethief was loaned to us by Ison Distribution, free of charge for this review. You can also read our initial summary of the Salsa Horsethief 3 and our final review of the Salsa Horsethief 3. (Cough) Chainstay (Cough) length is overrated. Of all the mechanical aspects of a bike that hold me back on the trail, they’re quite a way down the list. One theory is the chainstays may feel disproportionately long to someone on a smaller frame size while my bikes are sufficiently huge enough that I’m either not going to notice a few mm here and there or will actually benefit from it. Longer chainstays should give better tyre and front derailleur clearance, whilst allowing for a straighter seat tube and holding the front of the bike down on climbs. That said I’m sure there’s an ideal length that’s neither super short nor as long as the Horsethief’s, combining good handling and any other design requirements. Looks like a solid bike for the money, though I’m surprised you haven’t mentioned the down tube bend…last year’s model looked so much nicer! I’m in two minds about the affect of any single aspect such as CS length. CS length must also be part of overall wheelbase and I’d have thought that affected stability and turning more? Pop my Spearfish next to a Thomas’ Specialized Stuntjumper and it’s very short! Yes, measured my Stumpjumper at 1208mm, a Santa Cruz V10 is 1217. The downhill stability of that bike was ridiculous, turning required a bit of wrestling in the tight stuff but that didn’t stop it winning a Pro GRT event in the US recently. I can’t imagine the Horsethief is much different. 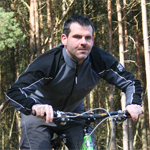 Judging by your HR at Swinley yesterday dave, you dont seem too hindered in the fitness dept currently! An iron man-like average of 159 over 27 off road k’s shows you were throwing the kitchen sink at it. Back to topic, this looks a cracking bike. Surely with more familiarity the handling issues will fade? Well Colin you’ll need to wait for parts 3 and 4 to find out! Several days ago, I was out on the Horsethief with Matt and Dave where we hit the Ranmore trails, Rip van Winkle, TTW3 (twice) and Golden Nugget. I got to ride it up, and then down, TTW3; as well as Golden Nugget, then back to Bookham via Polesden Lacey. I was out on my Santa Cruz Superlight 29er, aka ‘The Mondeo’ 😉 , before swapping over to the Horsethief. My first impressions were that it climbed well enough, certainly not too different to my SC SL. I hadn’t raised the saddle following Matt’s turn, and found myself having to stand up on the steep climb back to the start of TTW3. It didn’t bob excessively, and neither did the steering feel as vague as I was expecting, though that could be because I’m getting used to the feel of a 29er. I led down TTW3, and I tackled the rolling & rooty first session almost exactly as I would if I were riding the SC SL. I say ‘almost exactly’, as I was conscious that I didn’t want to stack it on the first descent and incur Dave’s (and Ison Distribution’s) wrath ! Although it felt a little strange, it seemed to go where I wanted despite a stem length some 20-30mm longer than I was used to, and forks that were less forgiving than the 2013 Revelations on the SC SL. Overall, I was very happy with the way it tackled the tight and twisty features of TTW3, though I would have liked less rebound with both the fork and the shock as both seemed a little under-damped for my taste. I didn’t really get the chance to play about too much with the set-up as I only had the bike for less than an hour. Golden Nugget was no less enjoyable, though Matt was clearly enjoying riding the SC SL as he was hot on my tail all the way down. In summary, my impression was that the Horsethief was a very capable bike, and one which could be further improved (or personalised) through a careful choice of components and taking some time to set it up to suit your preferred style. Just purchased my first full suspension bike, which happens to be the Salsa Horse Thief 3. I feel like I’d been driving a 1970 cutlass and just purchased a new 2013 Mercedes AMG. WOW, what a ride. The front and rear derailers are so responsive, and the braking is spot on. It was my complete surprise on the Horse thief’s appitite for swallowing whole any curb, rock or serious landing I would incounter. I am completely in love with this bike. I honestly think it is worth way more than what I paid. If you are considering this purchase, just do it. You will be pleased.